VATICAN CITY (CNS) — The apostolic visitation of U.S. communities of religious women, though initially met with some resistance, ended up promoting a greater sense of unity in the church and helped the women become more aware of how God is working in their lives, said the prefect of the Congregation for Institutes of Consecrated Life and Societies of Apostolic Life. “May the self-assessment and dialogue sparked by the apostolic visitation continue to bear abundant fruit for the revitalization and strengthening of religious institutes in fidelity to Christ, to the Church and to their founding charisms,” said Cardinal Joao Braz de Aviz, the prefect, at a Dec. 16 news conference at the Vatican. The apostolic visitation, carried out between 2009 and 2012, concluded with the publication of a final report summarizing the problems and challenges the apostolic visitors and the women themselves see in their communities. Joining Cardinal Braz de Aviz for the presentation of the report were: Archbishop Jose Rodriguez Carballo, congregation secretary; Mother Mary Clare Millea, superior general of the Apostles of the Sacred Heart of Jesus and the apostolic visitor appointed by the Vatican; Mother Agnes Mary Donovan, superior general of the Sisters of Life and chairperson of the Council of Major Superiors of Women Religious; and Sister Sharon Holland, vice president of the Servants of the Immaculate Heart of Mary and president of the Leadership Conference of Women Religious. Mother Clare, speaking to Catholic News Service, said one thing she kept in mind during the visitation was the experience of her order’s founder, Mother Clelia Merloni. 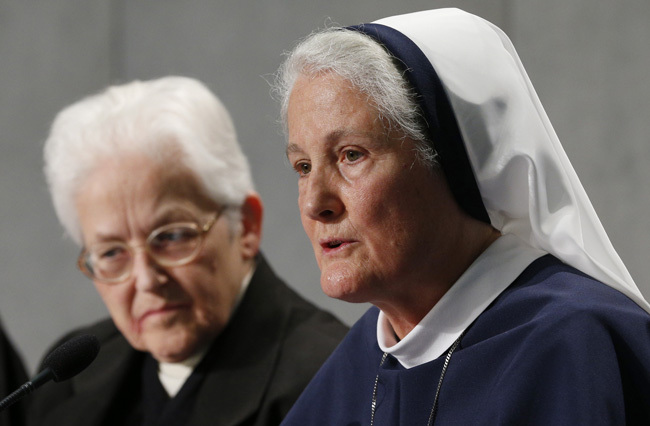 Because of “internal conflicts and jealousies,” she was denounced to the Vatican. “She was subjected to an apostolic visitation, removed from office and lived outside the congregation for 12 years.” Now “we are very close to her beatification,” Mother Clare said. Archbishop Rodriguez told reporters that the Vatican would not publish the individual reports out of respect for the communities involved. However, she said, the final report is “affirmative and realistic,” reflecting the vast range of experiences of U.S. communities of women religious and the complex social, religious and economic factors that have contributed to the declining number of sisters in the United States, their financial difficulties and their struggles to discern how best to organize their ministries as well as their community life. Archbishop Rodriguez said the congregation hopes U.S. religious communities “recognize themselves” in the final report and that it will help them in the future, including as they continue to reflect on ways to attract new members. The report noted that “the current number of approximately 50,000 apostolic women religious is a decline of about 125,000 since the mid-1960s.” And, it said, while all the orders have invested time and money in vocations promotion, most have not seen an increase in membership. Mother Agnes told reporters that while communities whose superiors belong to the Council of Major Superiors of Women Religious share many traits with those belonging to the Leadership Conference of Women Religious, their average age is much younger and membership continues to grow.